See also: Charleroi Interurban Artifacts - Bridges 1, 2, and 3. 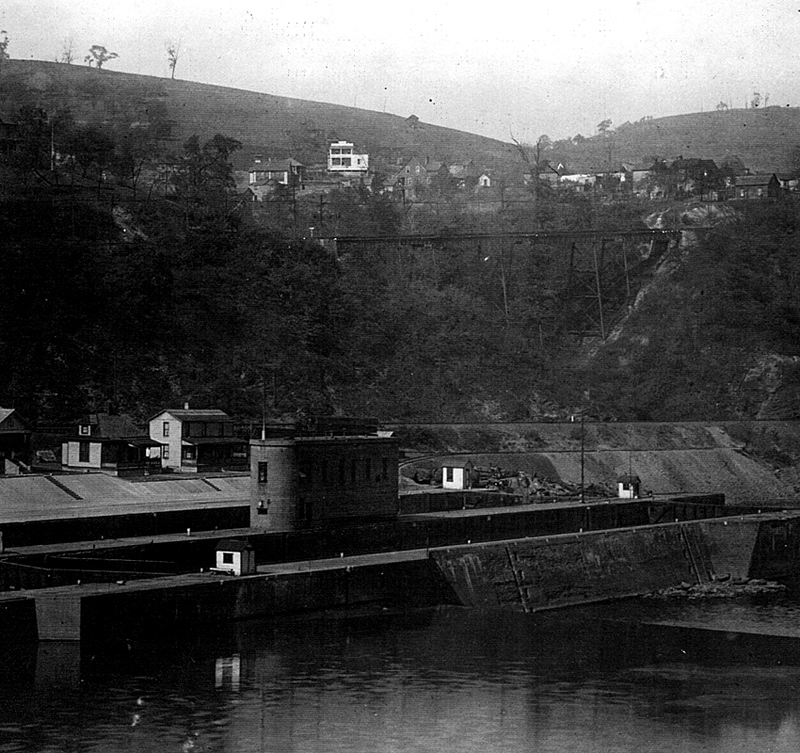 The Pennsylvania Railroad occupied the prime river-front route from Lock 4 to Donora. (An along-the-river highway was proposed but never completed. 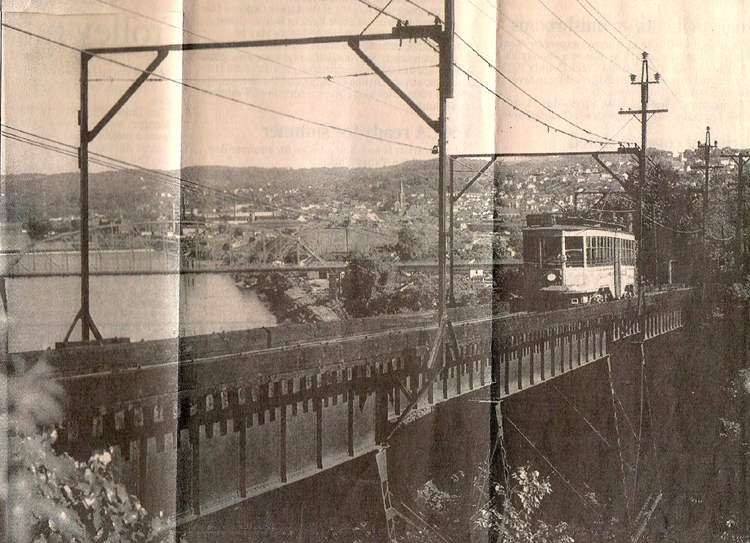 See Donora Will Be Aided In Fight For River Road from May, 1927 newspaper). For the PRCo line to travel from Lock Four to Eldora, bridges were constructed on Private right-of-way to span First Hollow - Bridge #1, Second Hollow - Bridge #2, and Third Hollow - Bridge #3. Bridge #1 is visible above and to the right of the old Lock #4. 1926. 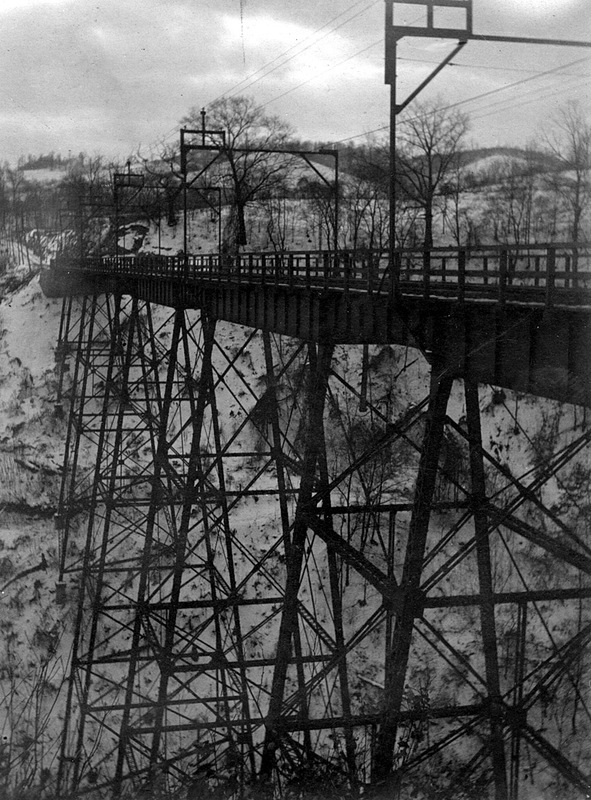 Another view of Bridge #1 above old Lock #4, 1926. 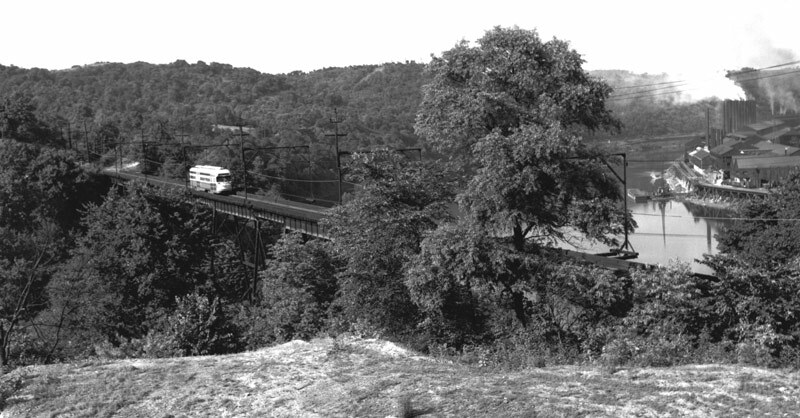 Caption from 1984 Headlights magazine: "Low-floor car 4387 rumbles across Bridge #1 north of Charleroi while en route from Charleroi Carhouse for service on the Donora-Riverview shuttle line. 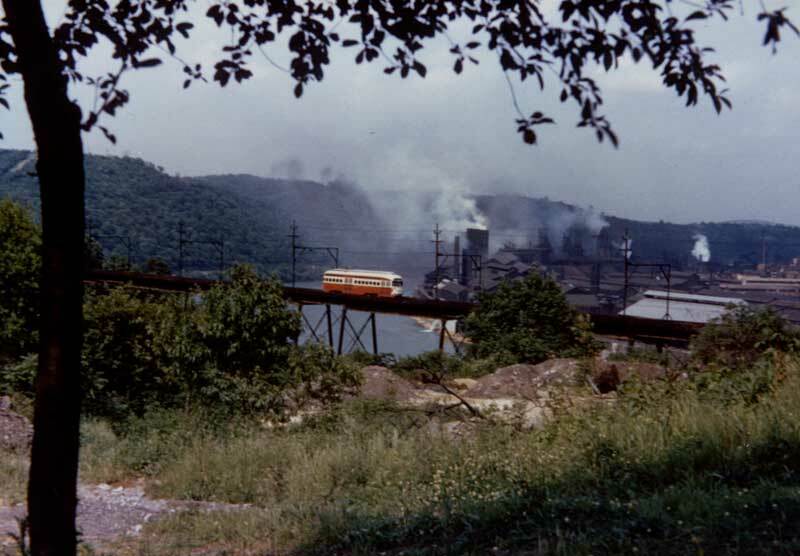 The 36-mile Charleroi line served the eastern end of a 125-mile long strip where blast furnaces and rolling mills provided employment for a half million steel workers and produced about half of the nations's steel and iron output. Edward S. Miller"
The same photo was published in a newspaper article. 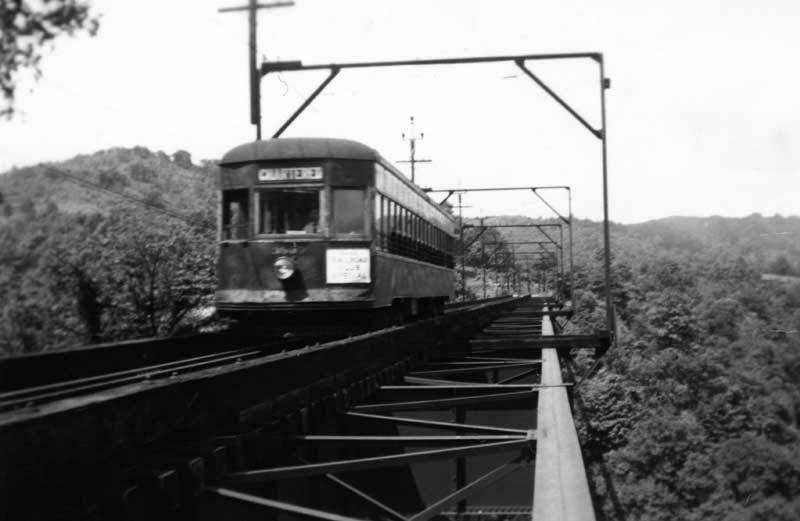 Caption from the article: In early years, Pittsburgh Railways Co. maintained a small fleet of double-end city cars at the Charleroi Car House to service the Donora-Black Diamond-Riverview trolley run. Here, crossing Bridge No. 1 in Fallowfield Township, is the rush-hour-only second car heading online on a summer afternoon, with Charleroi in the background. 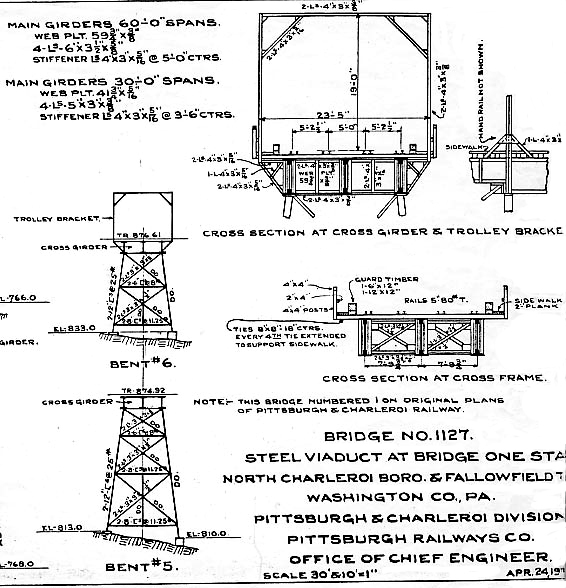 Engineering Drawing of Bridge #1. 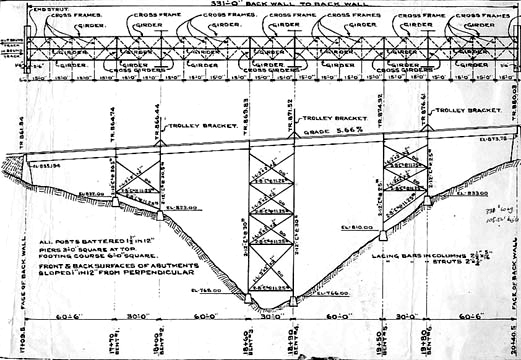 Engineering cross-section of Bridge #1. 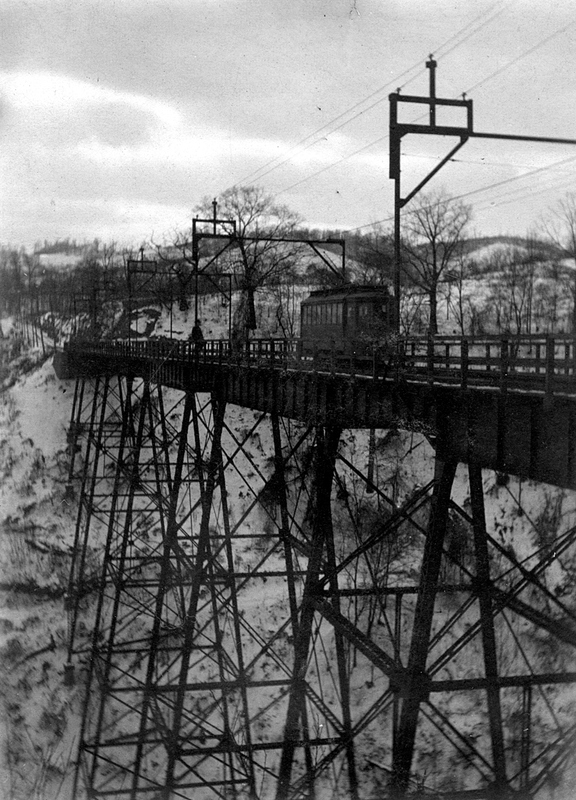 Caption from Electric Railroads article: "#1714 near Twin Oaks Sta. Charleroi in the background." This does appears to be Charleroi in the background, but there is no record of a "Twin Oaks Station" on any of available maps. This may have been an error in the original ERA article. 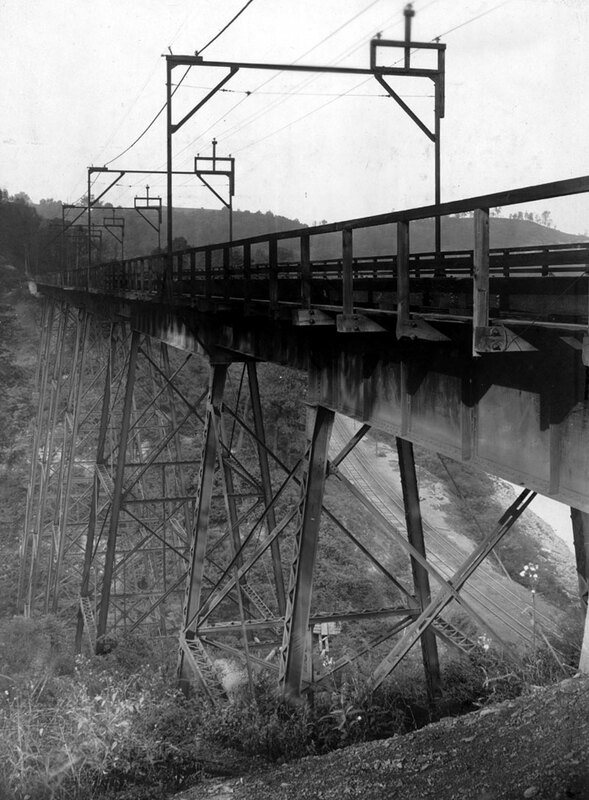 Plate girder viaduct, west of Monessen Ferry, [Pa.], built circa 1903. 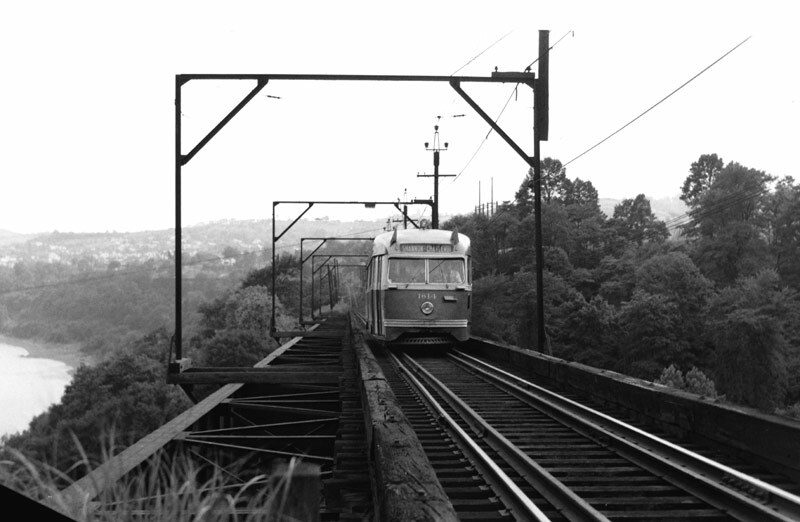 Pittsburgh Railways. Photo by C. K. Mohler, 1906. 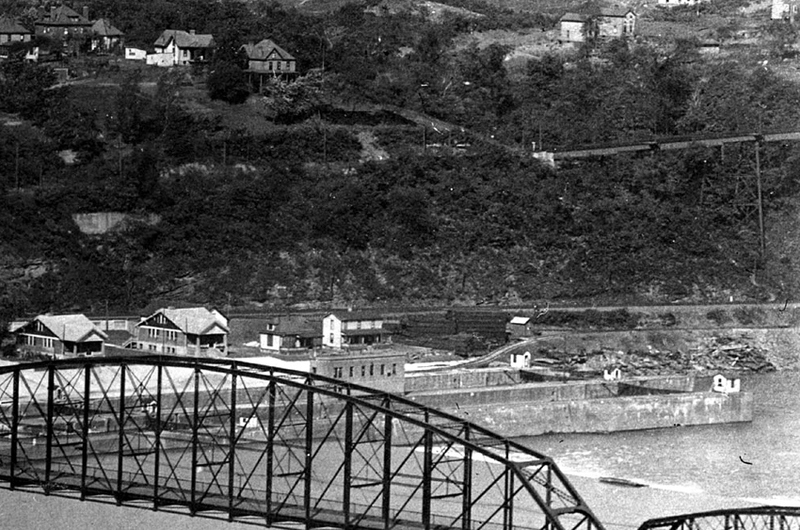 Pennsylvania Bridges Collection, Courtesy of Historical Collections and Labor Archives, Special Collections Library, The Pennsylvania State University. 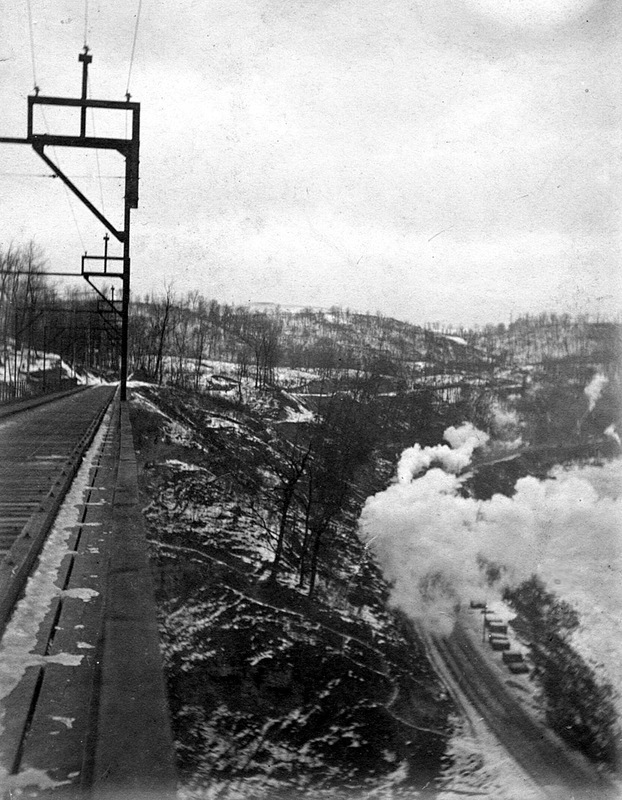 Photo from the Pennsylvania Bridges Collection, Historical Collections and Labor Archives, Special Collections Library, The Pennsylvania State University. 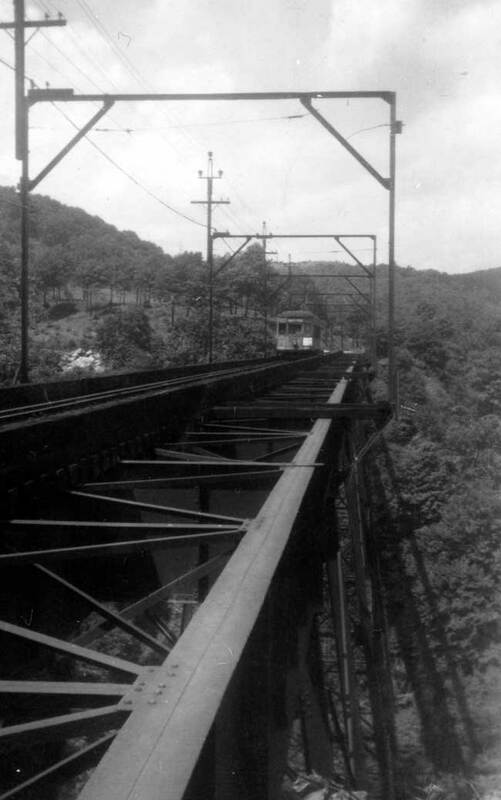 Their description is Plate girder viaduct, west of Monessen Ferry, [Pa.], built circa 1903. Pittsburgh Railways. Photo by C. K. Mohler, 1906. The Bridges can be identified by the number of bents. Bridge #2 had 12 bents. Bridge #1 had six, and Bridge #3 had ten. Bridge #2 from the south end of the bridge looking north. 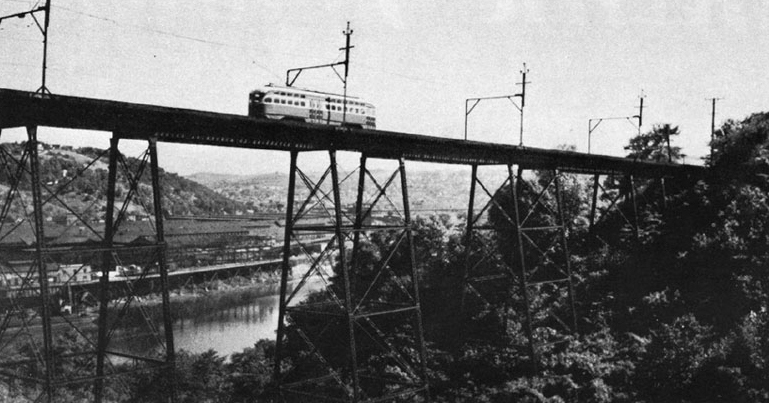 Note on photo: Charleroi Line of Pgh Ry’s Near Charleroi PA, about 300 ft above Monongahela river (not seen to extreme right of bridge). Trestle one of highest on line - 300 ft high, 700 ft long. 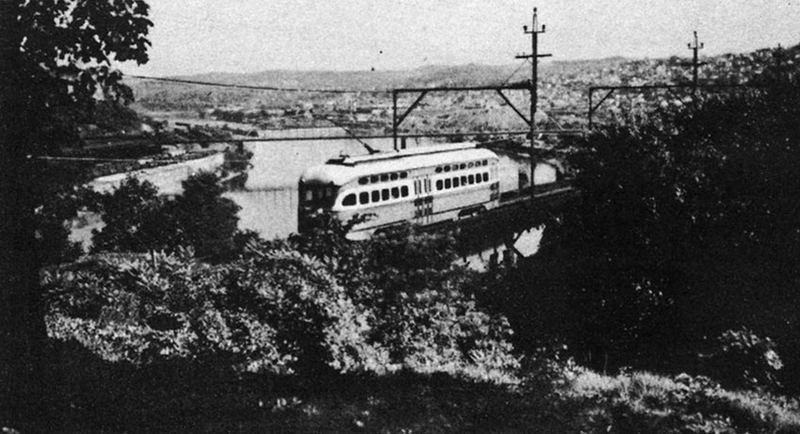 Pgh Ry # 3800-series car on Akron RR Club Chartered trip June 19, 1949. 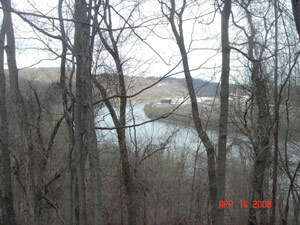 Note on photo: View of Monongahela River from trestle on Charleroi Interurban Line of Pgh Rys Co near Charleroi. River is about 300 ft below. 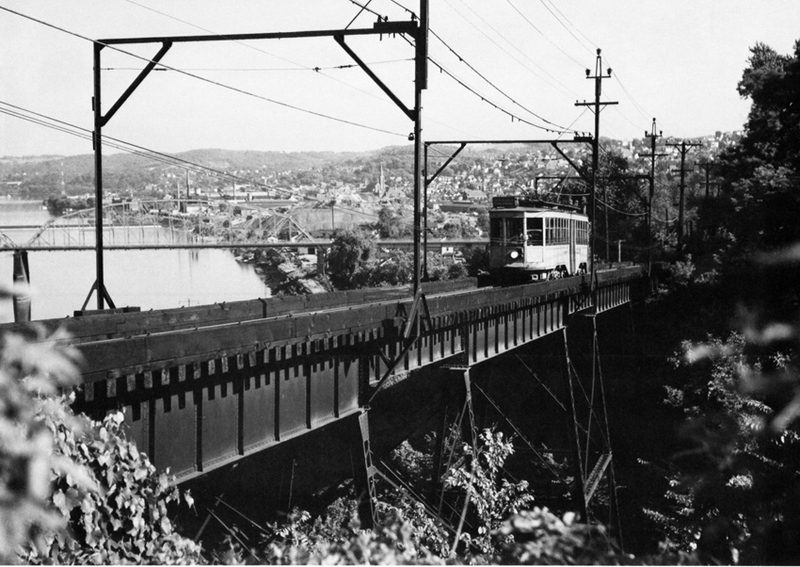 Caption from Electric Railroads article: "Outbound PCC 1722 on bridge No. 3 south of Eldora Summit. 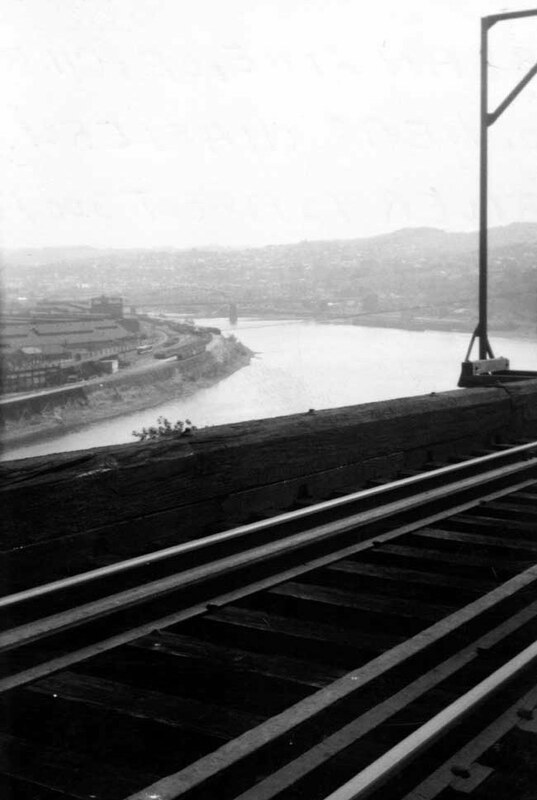 Background, Monongahela River and (l. to r.) Monessen and Charleroi."